Why Are People Freaking Out About These Satellites SpaceX Launched? A SpaceX Falcon 9 rocket launched 10 Iridium Next satellites from Space Launch Complex-4E at Vandenberg Air Force Base on Friday, March 30, 2018. 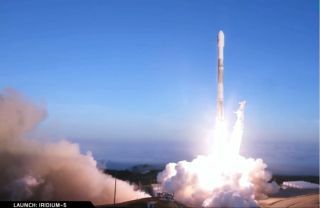 SpaceX pulled off another successful launch Friday, lofting a set of new polar-orbiting satellites. By itself, this Falcon 9 launch isn't unique. It's the fifth SpaceX launch this year. The launch was far less pioneering than SpaceX's maiden flight of the more massive Falcon Heavy rocket (carrying a Tesla car and a mannequin called "Starman") in February. SpaceX did reuse one of its rockets for today's liftoff, but that's old hat by now for the space company, which started reusing rockets exactly a year ago. Yet, the new launch still generated worldwide attention. Why? The answer has to do with what SpaceX launched: a set of satellites that will expand Iridium's Internet of Things (IoT) NEXT network. Earlier today (March 30), at 10:13 a.m. EDT (1413 GMT), SpaceX lofted the fifth set of 10 Iridium NEXT satellites from Vandenberg Air Force Base in California. The launch was successful, according to Iridium. "All 10 new satellites have successfully communicated with the Iridium Satellite Network Operation Center and are preparing to begin testing," the company wrote in an update. The 50 satellites currently in Iridum's NEXT network, including the 10 new ones, are improving tracking of IoT devices. The IoT refers to a growing trend of connecting common appliances or objects (such as fridges or shipping containers) to the internet to share information. "These devices are designed to do everything from tracking endangered species and monitoring power lines, to controlling shipping container temperature levels or serving as tsunami warning systems," Iridium said of its NEXT-tracked points of contact. Tracking these devices by satellite provides an extra advantage, because in rural locations, cellphone coverage is hard to come by. Iridium promises better tracking than before, using L-band broadband service. L-band is faster than the satellite ground terminals that would be used in its place, said Maritime Executive, a business magazine. Ka-band tracking is an even faster protocol, but its global extent was limited at least as late as 2014, according to NASA. That makes L-band a good start for Iridium. Here's where things get interesting. The NEXT network isn't nearly at full capacity, but before long it is going to cover the entire Earth. Iridum NEXT will see three more launches this year. By the time NEXT is fully deployed, at the end of 2018, it will include 75 satellites — 66 that are operational satellites and nine as on-orbit spares (in case something happens to the operating ones). Another six satellites will be available as ground spares. This is already attracting attention among Iridium subscribers. New people are joining faster than expected, Iridium chief executive Matt Desch said in a statement. Around the time of the launch, Iridium's subscriptions surpassed 1 million people. So, SpaceX's launch — as regular as it appeared — is important because it will help Iridium better track devices all over the Earth. As NEXT becomes more powerful, this will generate all sorts of tracking information to benefit customers. For example, tracking shipping containers will increase delivery accuracy and security. Monitoring remote power lines from afar will reduce the time needed to check them in person, Desch said. NEXT represents just one point in the growth of the global IoT market. According to Forbes, this market will triple, going from $157 billion in 2016 to $457 billion in 2020. While manufacturing is driving most of the growth right now, chances are, more consumers and companies will use IoT in the next three years. Will you be one of them? Time will tell.